Many of the same problems that affect people as they age, such as arthritis and diabetes, can also affect your pet. Making a few changes to the way you care for your furry friend will help you ensure that your pet stays healthy and happy as the years go by. Changes in your pet's behavior can be a sign that something is wrong. Sick animals can become more or less affectionate than before. Some may refuse to leave your side, while others will spend more time alone. Cats, in particular, tend to find out-of-the-way hiding places when they don't feel well. Changes in Eating Habits. Has your pet lost interest in eating or started drinking more than usual? A lack of interest in food can be caused due to dental issues, kidney or liver disease or a change in food, while increased thirst can be a sign of diabetes. Elimination Woes. Frequent constipation or diarrhea or difficulty urinating can be signs of serious illness and should not be ignored. Housetraining setbacks can also occur as your pet ages. Sometimes, making a few modifications, such as adding litter boxes to every floor of your house for your arthritic cat or adding a ramp to your home for a dog with hip dysplasia can solve the problem. Bumps, Lumps and Other Issues. Bumps and lumps can be caused by harmless cysts or may be a sign of cancer. The only way to determine the cause is with a visit to your veterinarian. Other issues that warrant a trip to the vet include frequent coughing, trouble breathing, vomiting or changes in your pet's coat. Good nutrition is essential to keeping your older pet healthy. Keep these tips in mind when selecting pet food. Buy Senior Pet Food. Help your pet maintain a healthy weight by feeding food specially formulated to meet the nutritional needs of older pets. Excess weight stresses the joints. If your pet already has arthritis, gaining weight will make symptoms worse. Avoid Overfeeding Your Pet. 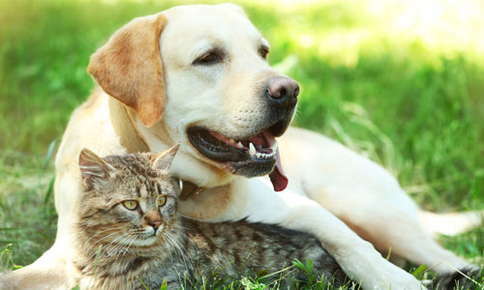 Older pets generally need less calories because they are less active. Adjust the amount of food you give your pet to avoid weight gain. Pay attention to the calorie count of treats, too. Buy low-calorie treats and limit the amount of treats you offer your pet. Get Rid of Free Radicals. Free radicals, unstable molecules that can contribute to aging and hamper immune system functioning, can be neutralized with foods that are high in vitamin E and beta-carotene. Choose High-Protein Foods. Although your dog may need fewer calories to maintain an ideal body weight, he or she still needs a diet high in protein. Protein is essential for maintaining muscle mass. Some cats have trouble digesting protein as they age. Before you buy a high-protein food for your cat, check with your veterinarian. Older pets will appreciate anything you can do to increase their comfort, starting with a soft place to rest. Look for cat and dog beds made of therapeutic foam that support your furry friend's joints. Heated beds will help your pet keep warm during the winter months. Staying warm is a particular concern for older pets. Pets that were perfectly comfortable on chilly days in their younger years may have trouble staying warm when temperatures drop. A pet jacket or sweater will help keep your senior pet warm, although dogs may be more likely to tolerate wearing a sweater than cats. Daily runs with your dog may have to end if arthritis or a general slowing down due to age is a problem. Although runs may no longer be possible, it's still important to make sure your dog still gets exercise every day. Playing games with your dog or cat not only improves physical fitness, but also helps keep your pet mentally sharp. Arthritis and other joint problems can make jumping more difficult. If your pet usually sleeps with you but has trouble jumping on the bed, buy pet stairs or a ramp to make getting into bed easier. Regular veterinary visits are very important as your pet ages. If it's been six months or more since we have seen your furry friend, give us a call to schedule an appointment.